And of course my other coconspirators Simon and Jez over at their respective blogs…. Turning to my own efforts this week I decided to turn my back on Frostgrave (though panic ye’ not, I shall be returning there next week) however for the moment I thought it was about time I got a little paint onto some more of the most excellent “Antediluvian” figures my lovely wife gave me for our wedding anniversary a few months back. Now while the two “Crystal Palace Dinosaurs” were given a coat of colour in short shift these chaps (and chap’ette) have been patiently sitting in their draw awaiting the call. Drawn from some of Hammer/Amicus’s finest hours, we have Raquel Welch as “Leona” the cave girl from “One million years BC” (interestingly advertised as Hammer’s 100th film even though it wasn’t! ), and “Dr Abner Perry” (Peter Cushing) and David Innes (Doug McClure) from a personal favourite of mine, Edgar Rice Burroughs “At the earth’s core”. I’m sorry but I refuse to use Antediluvian’s dreadful pun versions of their names. These were actually based up and undercoated last month in preparation for painting so it was a case of just getting them out and I was underway. I began Leona’s painting with a mix of chocolate brown and khaki that was used as the undercoat for all her chamois leather costume this was them highlighted with just khaki and then the edges were touched up with a mix of khaki and cream. I used my darkest European flesh tone (7) as her flesh undercoat and then after her eyes were added highlighted this with straight European flesh. The shaft of her spear was done in chocolate brown dry-brushed with butternut, and a little coffee was used to accentuate the cord beneath the flint blade that was dark grey highlighted with light grey. Lastly her golden locks were painted sand (miniature paints version) highlighted with lemon yellow. Next we turn our attention to Dr Abner Perry, who was again worked up from a black undercoat so as the majority of his costume is predominantly black just needed those part highlighting with a mix of black and dark grey, the back of his waistcoat (that you can’t see) was painted dark red that was then highlighted with pink burgundy, next his shirt was added in coffee and cream, and his face and hands were done in continental flesh that after his eye and monocle were added, was highlighted in the same with quite a bit of pale flesh added to the mix. His hair was black highlighted with dark grey and then the light grey streak was added over the crown, his moustache (yes there is one there, it’s small, but it is there!!) was done in black and dark grey. His collar stud and watch chain were done in shining gold and the handle of his brolly was done in chocolate brown and butternut. Finally we have David Ennis who I began by painting his trousers and waistcoat in a mix of black and chocolate brown that was then highlighted in just chocolate brown, his shoes were then highlighted again with leather brown before his shirt too was done in coffee and cream. His flesh was undercoated in European flesh that after his eyes were applied was highlighted with continental flesh. His hair was undercoated in sand and chocolate brown and then highlighted with just sand, but this time I used the colour party version that is considerably darker and browner in tone to the miniature paints version I used on Leona above. Butternut was used to highlight his spear shaft over a chocolate brown base and the point was done in chainmail. Shining gold was again used on his waistcoat buttons. After all this was dry they were all given a coat of Quickshade strong tone and next day they had their bases completed in my standard fashion of Chocolate brown dry-brushed in Khaki, then again in coffee and then having some areas picked out in scenic green that are then flocked with “Autumn mix” hairy grass. The whole lot were then sealed with a coat of matt varnish. I decided to go mad and dig out the prehistoric scenery pieces that I made a few years back now to use as the backgrounds to my photo’s this week as they seemed apt. These really are some very nice figures of some really cool characters from my youth, I can still remember going to see all the Doug McClure, Edgar Rice Burroughs films at the Odeon with my mum, and still love them now, anyway enough reminiscing time to be getting on with next week’s submission. 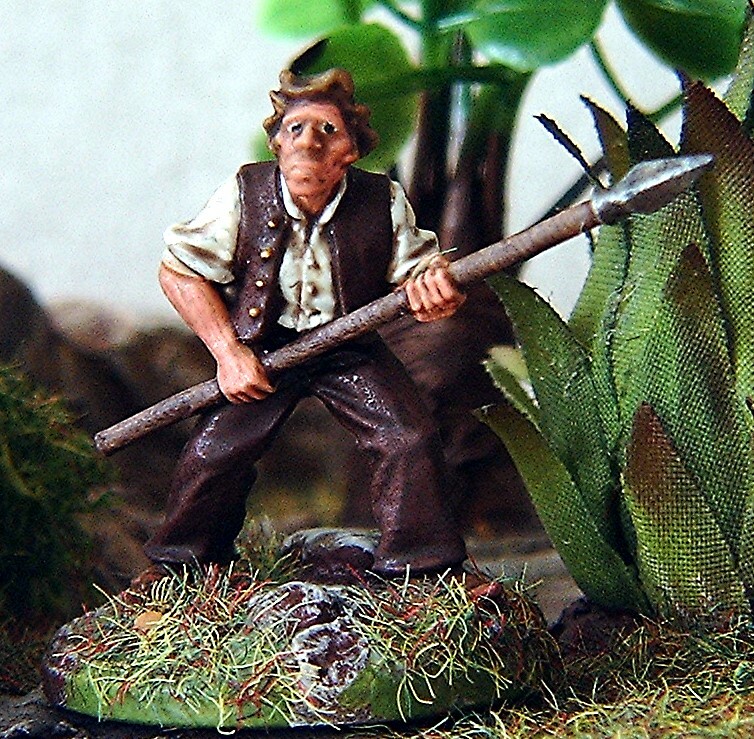 This entry was posted in 28mm fantasy, 28mm sci-fi, fantasy, Mo'vember, sci-fi and tagged 28mm fantasy, 28mm sci-fi, fantasy, Mo'vember, sci-fi. Bookmark the permalink. Thanks Jez, oh yes Dr Perry might have a small one by they all count (ooer misses!! 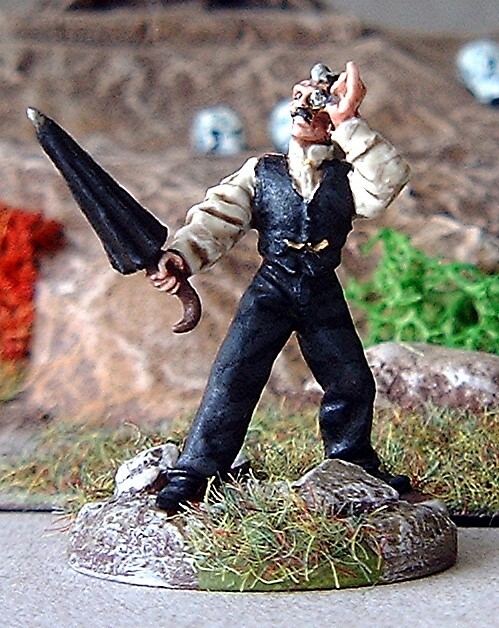 ), Antediluvian do have some really nice figs, I’m tempted by the Warlords stuff myself but it’ll probably have to wait for the time being, I really need to get a grip on my VBCW stuff in the new year before I start “flashing the cash” about. Yes you need to pull your finger out, or I might actually do more figures than you for a change! after loosing two rounds of He-month I might pull one back in the third. Great stuff Roger, and nice to see Peter Cushion as a Mo’Vember submission. I’m much impressed with your other two explorers as well, and so must get some paint on mine and finish them off. Love the fur highlights btw – don’t be expecting such delicate details on my Leona. Thanks Simon, these are lovely figures and it’s good to have them finally finished, I can see I’ll be buying more from Antediluvian in the new year. Oh and thanks for noticing the highlights. Absolutely splendid Roger, I have these on my Christmas list and will be thrilled if they come out as good as these. Yes you do Simon! but because you need to finish them before you get distracted again. Many Thanks Michael, I look forward to seeing how you paint them (Oh and please ignore the aborted reply above. To be honest, I’d have been surprised if you hadn’t Sinom (lol).